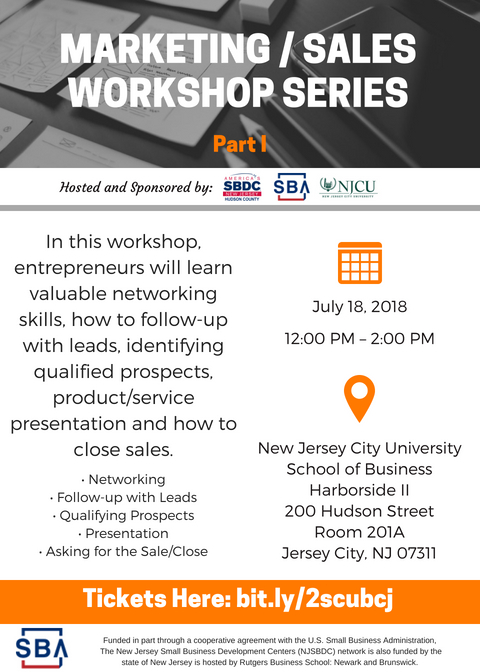 In this Introductory workshop, entrepreneurs will learn the basics of how to do market research, create a pricing strategy, understand their target markets, efficient engagement, and how to promote and sell. Central Parking- Plaza 4A (135 Greene Street, entrance is on Christopher Colombus Drive) for $5 parking with Eventbrite print out ticket. (See bottom of the image below). Traveling from the direction of either Bayonne or Hoboken, exit at the Harborside Station stop in Jersey City. Take the train marked Journal Square. At the Pavonia Newport Station transfer from the same track to the train marked World Trade Center and exit at the next stop which is Exchange Place. The Harborside is adjacent to the station entrance, to the north. Take the train marked World Trade Center. Exit at the Exchange Place Station. Harborside is adjacent to the station entrance, to the north. Take the train marked Hoboken or Newark and exit at the Exchange Place Station. Harborside is adjacent to the station entrance, to the north. New York Waterway operates weekday ferry service between Manhattan and Jersey City. From Midtown/ West 39th St, Pier 11/Wall St, or the World Financial Center, take the Paulus Hook ferry to Jersey City. The ferry stop is three blocks south of the Harborside. Please note: ferry service to Paulus Hook does not operate on weekends or holidays. New Jersey Transit has a comprehensive bus system that includes third party buses that stop at Exchange Place. Please visit the NJ Transit website for additional information and assistance planning a convenient route. Exit buses at the Exchange Place Station. Harborside is adjacent to the station entrance, to the north. Use “200 Hudson Street, Jersey City, NJ 07311” the main entrance to the building. Head northeast on John F. Kennedy Blvd toward Culver Avenue for 1.5 miles. Turn right onto Montgomery Street and travel 2 miles. Turn left onto Greene St., right at the first cross street onto Christopher Columbus Dr. then left onto Hudson St. Harborside’s main entrance will be on the right. Take exit 14-14A-14B-14C for I-78 toward US-1/US-9/US-22/ Newark Airport/Holland Tunnel. Take exit 14A-14B-14C for I-78 E toward Bayonne/Jersey City/Holland Tunnel. Merge ontoI-78 E and drive 6.2 miles. Take the exit toward Jersey City/Columbus Drive. Continue for 1.2 miles on Christopher Columbus Drive. Turn left onto Hudson St. (at light passed Greene Street), crossing over the rail tracks and travel 0.1 miles north. Harborside main entrance is on the right. Take I-280 East via the ramp on the left towards New Jersey Turnpike. Merge onto I-78 E and drive 6.2 miles. Take the exit toward Jersey City/Columbus Drive. Continue for 1.2 miles on Christopher Columbus Drive. Turn left onto Hudson St. (at light passed Greene Street), crossing over the rail tracks and travel 0.1 miles north. Harborside main entrance is on the right. Follow Lincoln Tunnel, crossing into New Jersey. Take the exit towards Willow Ave/Weehawken/Hoboken. Merge onto Park Ave/County Rd 675/Willow Ave. Turn right onto 14th Street/County Rd 670. Make a left onto Manhattan Ave/Paterson Plank Road and travel 1 mile south. Turn right onto Harrison, left onto Newark Ave, and right onto Marin Blvd. Travel 1.2 miles south on Marin Blvd then turn left onto Christopher Columbus Dr. and travel four blocks east. Turn left onto Hudson St. (the light passed Greene Street), crossing over the rail tracks and travel 0.1 miles north. Harborside main entrance is on the right. Follow Holland Tunnel, crossing into New Jersey. Immediately upon exiting make first right onto Marin Blvd. Turn right onto 18th Street. Continue onto Washington Blvd. Travel approximately 1.2 mile south. Turn left onto Christopher Columbus Dr. and travel four blocks east. Turn left onto Hudson St. (at light passed Greene Street), crossing over the rail tracks and travel 0.1 miles north. Harborside main entrance is on the right.